Ed went to Trinity College, Cambridge, where he read English literature before joining ITN as a graduate trainee in 1979. He was a founder member of Channel Four News in 1982, working as a scriptwriter but adding producer, duty home news editor and chief sub-editor to his duties. He reported from Beirut for the first time in 1983 and spent most of the next decade covering foreign news. He was appointed Channel 4’s Washington correspondent in 1986 covering the final years of the Reagan presidency and the 1988 presidential campaign. In 1988, he joined the BBC as Paris correspondent. 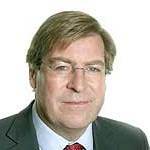 In 1990 he returned to ITN as diplomatic editor, and during his three years in the job he reported from Baghdad during the Gulf War, from Bosnia during the siege of Sarajevo, from Moscow in the final days of the Soviet Union and from Europe throughout the negotiations leading up to the Maastricht summit. In 1993, he returned to the BBC to present the One O’Clock News and editions of Correspondent, Assignment and Panorama before joining the Today team in 1999. An expert on Roman Catholicism, in 1997 he presented Absolute Truth, a landmark, four-part series for BBC Two on the modern Catholic Church and wrote a book to accompany the series. In addition to his presenting duties on Today, Ed often reports for Radio 4 on religion and current affairs.